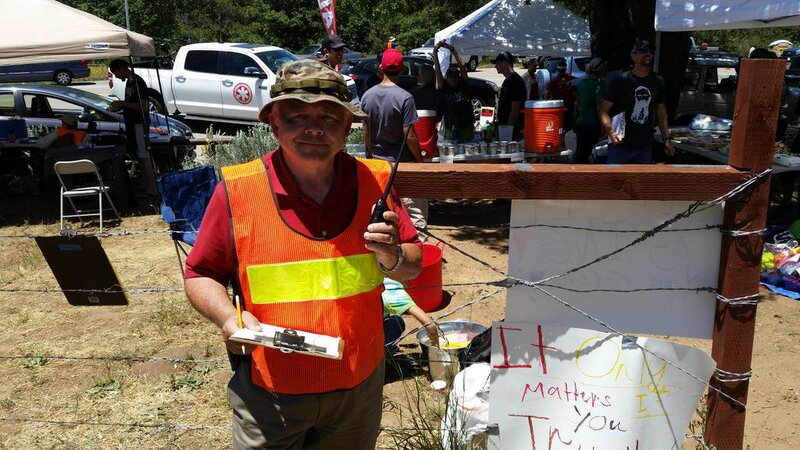 Ham radio volunteer in action at the San Diego 100. In the remote world of ultras, quick communication is key when it comes to finding lost runners and saving lives. With cell coverage spotty at best in most mountain ranges, ultra marathons must rely on the expertise of local ham (amateur) radio operators. If you’ve ever been to a race and seen a few of these folks glued to their radios it was probably fleeting due to their inconspicuous nature and solid commitment to monitoring radio frequencies. But they love what they do and without them, tracking runners through the mountains would be a lot more difficult (and expensive). Ham radio technology dates back over 100 years, and is used around the world. This popular form of communication can be utilized by passing a simple test to get an official call sign and license to operate on radio frequencies known as “amateur bands” from the Federal Communications Commission (FCC). During natural disasters and other emergency situations, it’s this method that first responders and others rely upon when other communications systems are down or overloaded. Mountain ultras such as the Waldo 100K get ham radio help from both the Lane County Sheriff Amateur Radio Operators (LCSARO) and Valley Radio Club, who bring a complete set up along with about 30 volunteers to help operate it. As former Waldo race director Craig Thornley stated in his blog, “They are self-reliant and need little to nothing from us, except an event.” Using repeaters on the tops of mountains (big antennas that receive and transmit radio signals), ham radio operators communicate with one another using the repeater’s frequencies. This widespread coverage helps track each runner’s location from aid station to aid station, and creates a system that not only helps in emergency circumstances but also in forming a broad network of people who monitor the frequencies and pitch in to help when they hear the call. As cell service and GPS technology continues to improve, it’s still expensive. Ham radio coverage might seem outdated, but it’s a free service and according to Tom O’Hara (call sign W6ORG) of the Foothill Flyers Running Club in Arcadia, California, “Cell phones do not work in much of the mountains or immediately after earthquakes and other disasters – ham radio is the first line of emergency communications.” Whether it’s a number of mobile ham radio stations at races, or a ham walkie talkie clipped to a pack during a run in the mountains, ham radio communication continues to be a tried and true method in the ultrarunning community. Unfortunately, the next generation of licensed ham radio operators is dwindling. Not only do ultras give ham radio groups the opportunity to practice their skills, but they also offer donations to the clubs (who cannot charge for their services due to their amateur status). These ham radio volunteers keep mountain races truly remote, while still making sure runners have eyes on them (without feeling like they do). So the next time you see a ham radio group at a race, thank them for all they do and maybe consider getting a license for yourself. Thanks for writing this. My wife Mary Catherine (KI4HHI) and me (KI4ASK) are trail runners and ham radio operators. When we’re not running, we’re often helping out. Running and radios go great together. Nice piece, Amy. I had a chance to experience the need first-hand last week volunteering as a medic at the Bigfoot 200. As a SAR member, couldn’t agree with you more on the need for communications & emergency response plans in remote mountain ultras. After spending three days with the HAM guys, I’m looking to get my license. We use ham radio operators for the Massanutten Mountain 100, usually local radio volunteers from the Shenandoah Valley Amateur Radio Club and Warren County VA’s Emergency Communications team. We rely on Hams heavily at the Vermont 100. Thanks for writing an article to highlight one of the unsung heros of the ultrarunning world! Thank you for your well-written article. I’ve been an amateur radio operator for over 40 years and still support multiple running events and public service event every year. Our Office of Emergency Management, local hospitals, fire departments, police departments, CERT (Community Emergency Response Team) and several schools have radios set up and ready for use. Our “hams” have invested thousands of dollars in portable and emergency equipment. Not only do amateurs operate regular radio voice but now have many digital modes of communications as well. During running events, we have reported injuries and even a cardiac arrest who walked out of the hospital about a week later. Additional information can be found at ARRL.org. As one of the HAM radio operators for this event, I have to say that the organizers did a great job putting it together, and were ever-so supportive of us radio operators. We do all that we can to make sure their races are as well supported as we can manage. If anyone wants to see who we are, go to http://www.ecsupportoregon.net/. Thanks to all the goBeyond people for their support too.